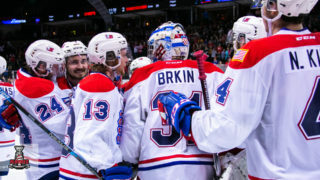 More than 30 current and former WHL players made their way to the Eastern United States this past week as National Hockey League Metropolitan Division teams held their annual development camps. 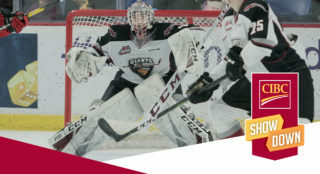 Led by three-time WHL Goaltender of the Year and two-time CHL Goaltender of the Year Carter Hart, and the 17th overall pick at the 2018 NHL Draft Ty Smith, a total of 33 WHL players and alumni from 17 different WHL clubs attended camps with the Carolina Hurricanes, Columbus Blue Jackets, New Jersey Devils, New York Islanders, New York Rangers, Philadelphia Flyers, Pittsburgh Penguins, and the Stanley Cup Champion Washington Capitals. The Carolina Hurricanes are looking to shake up their roster and have drafted four talented WHL players in recent years to help them do that. Leading the way is their 2016 first-round pick, defenceman Jake Bean of the Tri-City Americans. The left-hand shot defenceman was traded mid-season to the contending Americans from the Calgary Hitmen. Known for his offensive presence, Bean posted 18 points in 14 playoff games. This style of play, with the discipline Bean brings will add a key piece to Carolina’s future. In addition to Bean, Carolina has also bolstered their blue line with a sixth-round pick in 2017, selecting Brendan De Jong of the Portland Winterhawks. The two-way defenceman from Victoria B.C. provides good depth and solid decision-making. Shifting to offence the Hurricanes have selected two dynamic players in Morgan Geekie and Stello Mattheos. Geekie was selected in the third-round of the 2017 draft after scoring 90 points in 72 games. 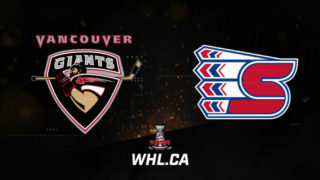 The 6-foot-2, 190-pound center further exemplified his impressive WHL totals by scoring 17 goals in 14 playoff games and adding 10 assists for a total of 27 points. The strong forward has a gift for putting the puck in the net, coming off his second straight 30-goal campaign. Mattheos was selected six picks after Geekie, 73rd overall in 2017. The two are very similar players, with Mattheos scoring 43 goals this season and finishing with 90 points in 68 games. The Blue Jackets are a young and dynamic team that focus on physical play, but also on shifting from defence to offence quickly with speed. Trey Fix-Wolansky will help them on that front tremendously. The only player from the WHL attending the Blue Jackets camp is their most recent seventh-round draft pick. Fix-Wolansky managed to rack up 89 points (32G-57A) in 71 games with the Edmonton Oil Kings this season. While he is a smaller player, listed at 5-foot-7, he doesn’t shy away from the physical game, and brings both physicality and speed to the lineup. The Devils had a successful campaign that saw them reach the playoffs for the first time since 2011-12. Having pick number 17 overall in the 2018 NHL Draft, they selected Ty Smith of the Spokane Chiefs. Smith had a successful season in Spokane, recording 73 points (14G-59A) in 69 games while also posting a plus +/- 44, attesting to his defensive abilities. The Devils added another defenceman as a free agent in Colby Sissons, who was a key part of the Swift Current Broncos 2018 Rogers WHL Championship-winning team. Sissons posted 71 points (13G-58A) in 72 games while recording a plus +/- 46. He added another 23 points (5G-18A) in 26 games en route to winning the Ed Chynoweth Cup. 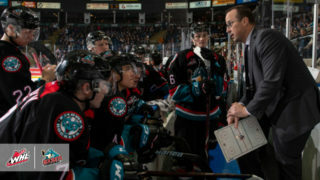 John Quenneville, who is also a WHL Champion from 2015-16, played last two seasons in the American Hockey League where he accumulated 80 points (28G-52A) in 101 games. Kieffer Bellows wasn’t in the WHL when he was drafted by the Islanders, but his decision to join the Winterhawks on the West Coast has paid dividends for himself and his NHL club on the East Coast. He posted 74 points (41G-33A) in just 56 games during the 2017-18 campaign, helping the Winterhawks reach Round Two of the 2018 WHL Playoffs. Bellows is a large, skilled forward who can shoot the puck, as evidenced by his 41 goals in 56 games and 9 goals in 7 games playing for USA at the U-20 IIHF World Junior Championship. In addition to Bellows, there are three WHL Alumni attending the Islanders camp. Eansor was the captain of the 2016-17 WHL Champion Seattle Thunderbirds. Wotherspoon, who was also a part of the WHL Champion Thunderbirds, posted 66 points (10G-56A) in 69 games in his last season. Quenneville played for the Medicine Hat Tigers last season where he scored 80 points (26G-54P) in 70 games to pace all defenceman. He added eight points (1G-7A) in six playoff games. The New York Rangers are primed and ready to tackle the future of their organization thanks to some key players from the WHL. Adding defenceman Libor Hajek and center Brett Howden in a trade with the Tampa Bay Lightning helped to strengthen those numbers. Hajek was a second-round draft pick of the Lightning in 2016. The Czech Republic native has good offensive capabilities, posting 39 points (12G-27A) in 58 games. He can also play big minutes, averaging around 27 to 30 minutes while with the Saskatoon Blades. Another part of that trade was center Brett Howden, taken in the first round of that same draft. Howden has played 248 WHL games across five years, posting 267 points (109G-158A). This skilled forward is also a leader, serving as the alternate captain in 2015-16 before being named captain for the last two seasons. Ronning was a late pick in the 2016 draft, going in the seventh round. The small winger is listed at 5-foot-9 but is no stranger to physical play. His impressive offensive abilities earned him a contract with the rangers, adding to their young and growing core. "Seeing the Statue of Liberty made all of us who had never been there feel like we were in Disney Land." In his 2nd journal entry, @B_Howdy21 writes about touring @TheGarden, visiting the 9/11 Memorial, boat cruising around NYC and more. The Flyers have been in desperate search of an elite goaltender and they may have found it in Carter Hart. 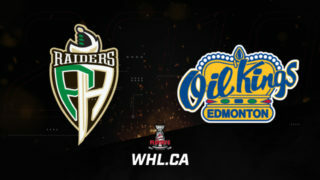 Hart is coming off a season that saw his team reach the 2018 Rogers WHL Championship Series, and him individually win the Del Wilson Memorial Trophy as the WHL Goaltender of the Year for the third consecutive year while also clinching CHL Goaltender of the Year honours for the second time in three years. Hart finished last season with a league-best 1.60 GAA, 0.947 save percentage and record of 31-6-4. Hart also holds a tie with Tyson Sexsmith for the most shutouts in WHL history with 26 career clean sheets. The Flyers went back to Everett during the 2018 NHL Draft, selected Hart’s teammate Wyatte Wylie in the fifth-round. The Everett, Wash. product put up 31 points (6G-25A) in in 72 games. In the 2016 NHL Draft, the Flyers selected Carsen Twarynski. Twarynski is a strong forward, standing at 6-foot-2, 198-pounds, he plays a physical game and is known for hitting the twine. Last season Twarynski scored 45 goals in 68 games. He got the opportunity to play with the Flyers AHL affiliate where he recorded two points in five games. The Penguins opted for an offensive defenceman with their first selection in the 2018 NHL Draft. Addison posted 65 points (11G-54A) in 68 regular season games and added 19 points (7G-12A) in 16 games during the playoffs. The Brandon Man. native is listed at 5-foot-10, 179-pounds, but size on the blue line is hardly an issue in today’s game. And a blue liner than can score makes up for any lack of size. While Pittsburgh only had four selections in this year’s draft, they drafted two WHL players, the latter being Justin Almeida from the Moose Jaw Warriors. Almeida had a very successful campaign posting 98 points (43G-55A) in 72 games. He is a small skilled forward, listed at 5-foot-9, 159 pounds but uses his skill and shot to make up for it. Due to the lack of draft picks the Penguins have also invited Kamloops Blazers left wing Brodi Stuart. Stuart finished his first season in the WHL with 38 points (16G-22A) in 70 games. The Penguins have invited 38 players to their annual prospect development camp, which will be held June 27-29 at #UPMC66. 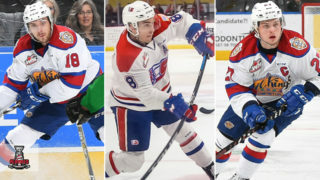 The Washington Capitals are no stranger to the WHL, having selected nine players from the WHL in the past four NHL Drafts, eight of who will be at this year’s development camp. The Capitals also had nine WHL Alumni win the Stanley Cup with them this season, adding to their WHL roots. Four of the nine players attending were drafted in 2018, including Florchuk who was the very last pick at the draft. Due to their success from drafting WHL players, the Capitals have decided to goaltender Logan Thompson to their camp. The Calgary, Alta. product just committed to Brock University after finishing his final season of eligibility in the WHL. The former WHL Champion and All-Star has good size at 6-foot-3 and the Capitals will hope they found another diamond like Brayden Holtby (who is also a WHL Alumni). While teams take chances on small agile players, the Capitals have stuck to what worked for them in their playoff run, size. Drafting a 6-foot-4 defenceman in Alexeyev and 6-foot-3 winger Riley Sutter adds to their towering NHL line-up. But while they added size, these players are also skilled, and can put up points.